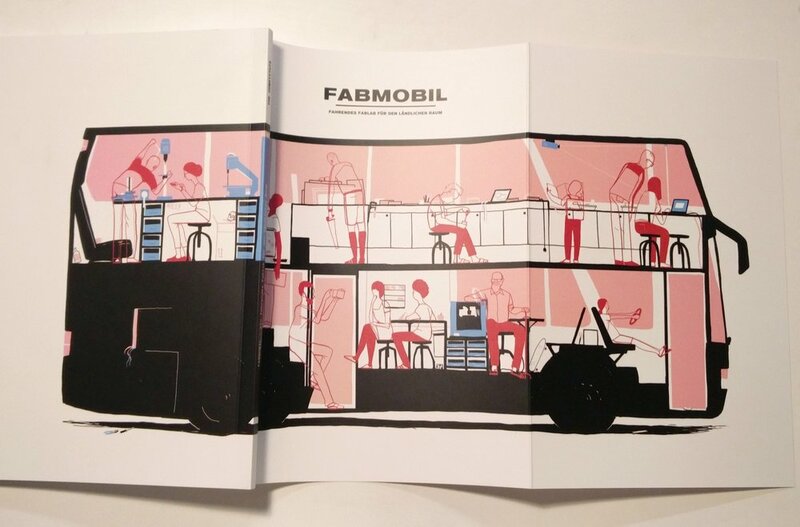 The Constitute has been hard at work, to cast the last years of roller coaster-ride that is the Fabmobil into a documentation-style book form. It features a project history, photographs, interviews and of course also the drawings I made for the project in May 2018. My previous write-up about the project here. It is always nice to receive the actual printed matter I work on, but this one is special. I like the way illustration is used in general here. Usually I receive a subject and have to generate ideas on what is given. Here the drawings were finished long ago, the subjects decided on the spot. Christian and Sebastian then had a pool of images to choose from to illustrate their articles, as they saw fit. The pairing of subjects and image might have been a nice creative challenge in itself. The images are not direct analogues of the text, but they rather offer another view on it – since long an ideal I think illustration should aspire to. They are at times enlightening, but can also create a tension between image and text. In the best sense the elements compliment each other. I like the more emancipated role illustration has in this form of working. More could be said about seeing photography and illustration of the same subject next to each other, but I will not write an essay about it right now. I find this way of working intriguing. I think it offers more creativity to the illustrator and also to the designer. Of course this hardly possible in usual editorial assignment. But that’s what I said up top: This one is special. I am happy to say, that we are also planning a second installment of this cooperation, that is going to happen in the summer. I am very much looking forward to it.